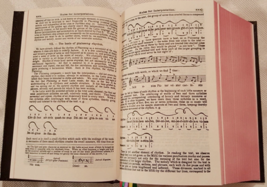 The last edition published for the English-speaking world with Gregorian notation and English rubrics. Follows the 1962 rubrics with proper feasts of the USA. With a supplement to the Feast of the Immaculate Heart of Mary for votive Mass during Lent or Paschal season. Cream Bible paper, Skivertex cover, Permalex end sheets for a durable binding and long-lasting use; Smyth sewed, red edges, six ribbons. The spine and front cover are stamped with the title in a medieval script. A compilation of Gregorian chants, all of which are in Latin, with introductory text in English. This book was published in 1959 with the imprimatur granted in May 1956. 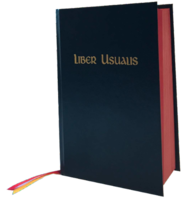 The Liber Usualis, (pronounced Lee-Behr Oos-oo-ah-lees and Latin for "The Book of Common Use") is a practical combination of the various official liturgical-musical books of the Roman Rite (e.g., Kyriale, Graduale Romanum, Cantorinus, Officium Hebdomodae Sanctae Instauratus)used for both chanting the various parts of the Divine Office and the Holy Sacrifice of the Mass. 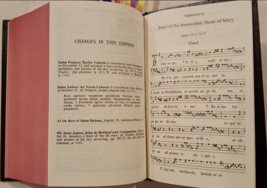 It also contains a wealth of ancient Latin hymns, ad libitum Kyriale modes, litanies and even the Ordo Missae(the Ordinary, Prefaces and Canon of the Mass) allowing it to also be used in assisting at Mass. The Liber further explains (in Latin) the names of the various components of Gregorian chant, the method for properly rendering it according to the "Solesmes method"(ordered by the Holy See to be followed by all who use the Roman Rite), how to chant the Lessons, Epistles and Gospels, a universal 1962 Roman calendar, and a section on general rubrics for applying the calendar and classification system (according to the 1960 reform). In addition, it features important particular rubrical notes as necessary (e.g., for the ceremonies of Ash Wednesday), a general index as well as alphabetical indexes for the various parts of the propers, antiphons, psalms, canticles, hymns, and much more! 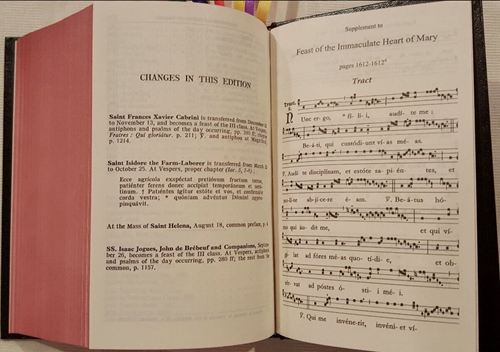 Additions in this new reprint include a supplement for the Mass of the Immaculate Heart of Mary (celebrated on August 22nd); the tract to be said during Septuagesima season & Lent; the extra Alleluia to be said during the Easter season in place of the gradual; and an updated table of moveable feasts. Printed in Latin (only), in black text throughout, all of the Gregorian chant notation contains the important rhythmic signs developed by the Benedictines of Solesmes during their lengthy chant reform(ordered and sanctioned by the popes) in the early 20th century. 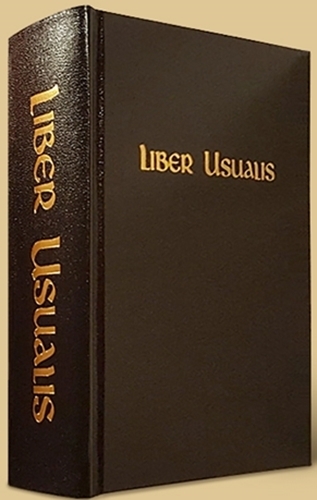 This hefty, 7½" x 5" x 2" thick book is handsomely hardbound in black cloth with gold embossing on the spine, has red page edgings, 6 multi-colored ribbons, and sewn binding. The binding is reinforced at the hinges of the book and includes durable end sheets for longer lasting use. The cream white paper aids in hiding the back side of the page that may cause excessive shadows of notes from the other side to show through. 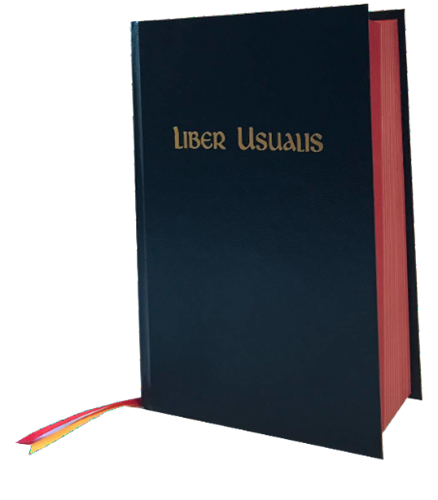 Our reprinted edition is from 1963 with the 1962 rubrics which are in English, not in Latin, as some of the more recent printings have been. 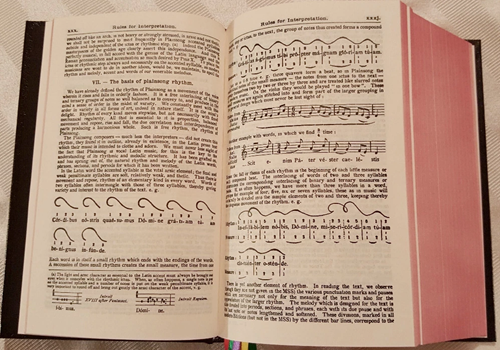 This edition has kept the original Gregorian notation for the chant. Size: 7.5" x 5" x 2"